The Xiaomi Redmi note 5 is arguably the most anticipated Xiaomi mid smartphone at the moment. The predecessor which is the Xiaomi redmi note 4 really enjoyed a very successfully year all thanks to its affordable price and considerably large battery. 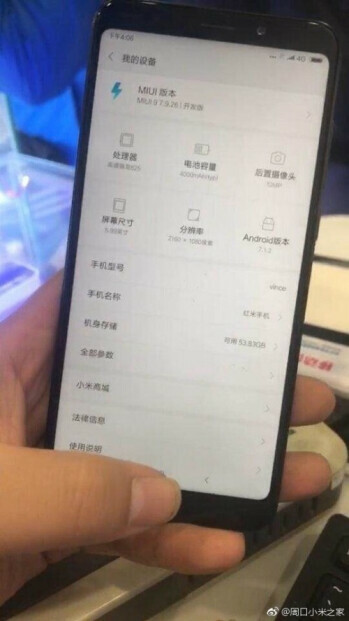 Xiaomi will really hope to live on the popularity and success of the redmi note 4 with the upcoming note 5 and the leaked images on Chinese website weibo further confirms that Xiaomi might be going for a bezeless display on its redmi note 5. The device is expected to sport a 5.99-inch full HD+ display with a resolution of 2160 x 1080 pixels and 18:9 aspect ratio. China's Weibo also claims that the device will be powered by Qualcomm's power efficient Snapdragon 625 chipset, same as the one used in the Mi Max 2 and also a 64GB internal storage which is standard in most of Xiaomi's mid and high end devices. Base on recent images making rounds online, Xiaomi might be going for a dual rear camera of 12-megapixel and the device will most likely run on MIUI 9 OS which is based on Android 7.1.2 Nougat and also a 4,000Mah battery. Of course, the above specs are not official yet but don't expect the official specs to be far from what you see above and although there is no price mentioned yet, we expect it to be very competitive. I will definitely keep you guys updated whenever something new comes up.